One of the reasons I like smoothies is for their garnish potential! Garnish also helps turn a smoothie from a snack into a complete meal. And I always keep extra smoothie garnishes handy so that I can garnish as I go. Come on, you know your kitchen table has totally been missing a garnish station. My favorite smoothie garnishes are as follows – what would you add to the list? Pumpkin Seeds – Let’s face it, pumpkin seeds are a great garnish for everything. Coconut Flakes – What’s not to love? They are crispy tasty fantastic. For some reason most grocery stores don’t seem to stock this (don’t try to substitute with desiccated coconut) but Amazon has quite a few options and it’s not very expensive. Sea Salt – Salt actually brings out the flavour and sweetness of the ingredients used in the smoothie. You could even get fancy and rim your smoothie glass with salt! Jumbo Oats – Classic, also good blended INTO the smoothie itself. Swiss Muesli – A little fancier than straight up oats and usually brings with it other tasty garnishes like seeds and dried fruit. 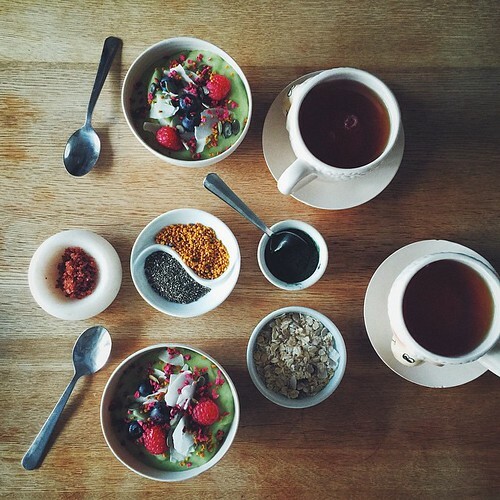 Don’t spend lots of money buying this stuff; make your own custom Homemade Muesli Blend. Goji Berries – The most overhyped dried fruit in the universe, but they’re pretty and look so nice on green smoothies! Hefty tip: soak the goji berries ahead of time; they can be discouragingly chewy. Goji berries are sold all over the place now, alas, for a hefty price tag; if it’s only the color your after, dried cranberries make a nice substitute. Bee Pollen – Little crunchy morsels of honey sweetness. I’ve been a little obsessed with this stuff since I discovered it in France last year. I try to stock up whenever I go back, but for those of you who aren’t France-bounce, you CAN buy bee pollen elsewhere (after all it’s not like bees are a strictly French thing!) – there are lots of options on Amazon . Acai Powder – Allegedly increases energy and “vitality”; I just like it for its bitter berry tastiness. I use Naturya Organic Acai Powder . Maca Powder – Malty sweet goodness originating from a tuberous root grown in the highlands of Peru. I’ve been using Naturya Organic Maca however I’ve recently cut back my usage when the company (very responsibly) informed me of unethical business practices and biopiracy which have made maca a bit taboo and difficult (i.e. expensive) to source. Use your best judgement here! Spirulina – Most people blend this happy protein into their smoothie but I have actually developed quite a taste for the stuff and prefer it as a garnish so that I really know it’s there! I use this stuff a LOT and have been getting my Organic Spirulina in bulk from myprotein.com. Cacao Nibs – I like these in banana-based smoothies, or in a mint chocolate chip blend. I use Naturya Organic Cocoa Nibs . Grated beetroot – I use a Kuhn Rikon Grater & Julienne Mandoline to make cool little beetroot matchsticks (see the picture below, made with golden beetroot). Puffed Grains – Rice, millet, amaranth, quinoa… I’ve been enjoying Biona Organic Amaranth Pops lately. Freeze-Dried Raspberries – I discovered these little morsels of crispy tart goodness at Waitrose; they’re kind of expensive, but they look so pretty! You can also buy them on Amazon . Granola – Try Mardi’s Maple Walnut Granola or go crazy with savory granola. Fresh fruit – Especially raspberries and blueberries. Monica I LOVE this so much 🙂 SO many great ideas! Milled flaxseed! I must add that to the list! If you do setup a garnish station, do take a picture so I can see it! One thing I miss at breakfast time when I have a smoothie is the sensation of eating something rather than just having a drink. 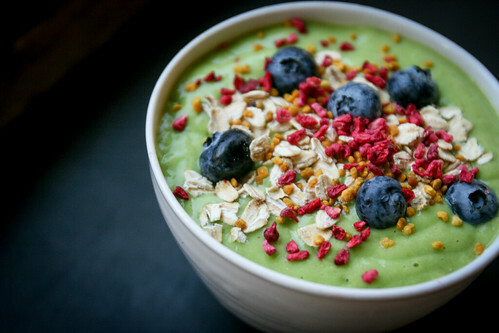 I like your idea of presenting the smoothie in a bowl with a garnish on top, it looks more like a proper breakfast then. Eating it with a spoon also helps with that “proper breakfast” feeling! Fantastic ideas – thanks for sharing! Since we eat with our eyes, I think your garnishes make these smoothies so much more tempting and also give additional texture, something to chew or crunch. Good call on the flaked almonds! I haven’t tried that yet but I’m totally on it. I predict that garnish stations will be a new facet of Ikea kitchens in the coming years! I love your garnish ideas Monica. 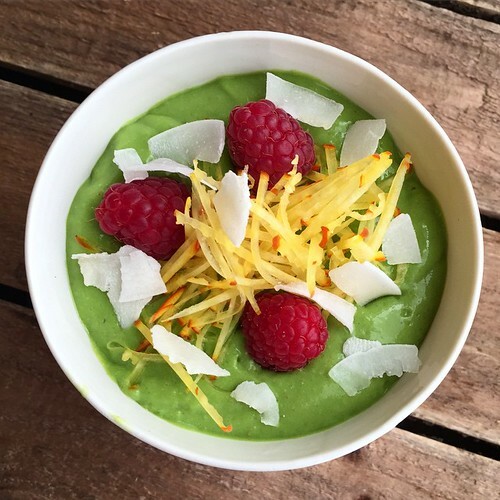 The smoothie bowls you have in the photos look so tempting. I am eager to try some of your suggestions as I have been much less adventurous with my breakfast up to now.